GRAND MASTER HOT DOG CART. 8 Burner commercial grill w/grease tray. 2 Full size steam tables w/controls (pans included). 4 Sinks (wash, rinse, sanitize & hand washing). Hot & cold water (swivel faucet). 5 Gallon fresh water tank. 7 Gallon disposed water tank. Insulated beverage bin w/drain (400 cans). Condiment table w/4 pans & notched lids included. Extra storage compartment for buns. Extra storage compartment for sodas. Steel canopy for magnetic banners & menues. One large vendor side shelf. 2 Propane tank enclosed compartment. 1 7/8 Ball coupler w/safety chains. The 116,000 BTU grill on the Grand Master hot dog cart is an eight burner commercial grade LP gas. It has huge capacity and it is designed to make professional grilling easy. It cooks up to 65 hamburgers or 126 sausages at once. It offers 1001 square inches of grilling space. It is designed for high-traffic events. The drip tray is below the grill and sufficient to hold grease for months, so you won't have to clean it every day. Please keep in mind that people prefer grilled hot dogs and sausages rather than steamed. The steam table on the Grand Master hot dog cart is double and can accommodate various size pots and lids. You can use the steamer for the buns, chili and sauerkraut. You can also steam your hot dogs since the steam table has its own burner and shut off valve. The stainless steel pans and lids (2 spillage pans, 6 1/3 pans and 2 roll tops1) are included and easily removable for cleaning. These are NSF approved and listed. The Grand Master hot dog cart has four sinks with hot and cold pressurized water. The standard water capacity is 5 gallon fresh water tank and 7 gallon disposed water tank. The beverage bin on the Grand Master hot dog cart has its own drain and is insulated to maximize the life of the ice. The lid on the bin is hinged and easily reachable for the customers to help themselves and for you to refill it. The condiment tray on the Grand Master hot dog cart consists of a stainless steel box with enough space to fit 5 pans and slotted lids. Here, you can offer diced onions, relish, pepper rings, jalapenos, dill pickles or anything else you would like to offer. All five containers and lids are NSF approved and listed. The stainless steel condiment box is sealed, so you can add ice underneath the pans. The Grand Master hot dog cart has plenty of storage space to keep all your supplies. All doors have their own safety latch. The steel canopy on the Grand Master hot dog cart is red and yellow but can be changed to the colors of your choice. The steel construction of the canopy allows you to set magnetic signs all over the canopy. The grill and the steam table on the Grand Master hot dog cart run on propane. There are two propane tanks stored neatly and easily-accessible behind a door with a safety latch in its own propane compartment. It holds two twenty-pound tanks, so you will not run out in the middle of the day. The Grand Master hot dog cart rests on a D. Approved heavy duty trailer (title available) with baked enamel finished. The leaf spring suspension system allows you to tow it safely at freeway speeds. The tires size is 4.8" x 12" standard. The tow bar hitch on the Grand Master hot dog cart is removable (great feature, as this looks better and you can walk around the trailer without having to jump over it). It is equipped with a 1 7/8" ball coupler with two safety chains, and is also available with an optional size 2" ball coupler. The Grand Master hot dog cart has tail, stop, signal and hazard lights. The wiring harness for the lights is male, and it comes with a license plate holder. Keep your Grand Master hot dog cart on the level with this easy-to-use 1500 lb. With the swing-back style there's no need to remove the jack when hauling the hot dog cart, just fold it back and away. The trailer jack has a side crank handle to level it. What you will love about this hot dog cart is that you won't need to carry extra sodas, trash containers, buns or propane tanks in your vehicle. Everything fits in the hot dog cart. You just hook the trailer and go. When you get to your vending location everything you need is already in the hot dog cart, and at the end of the day when you leave, there is no loading. This is a very practical and great looking hot dog cart. It has a very high performance and really attracts customers to you. How do I get my hot dog cart? Your hot dog cart will be palletized and crated at no additional charge. With a subject line of Attn: Quote Request. How do I track my hot dog cart? We strive to provide accurate tracking information in a timely manner. However, in some cases factors beyond our control may impede this process. When can I expect my hot dog cart to arrive? However factors beyond our control may effect your hot dog carts arrival date. When can I expect my hot dog cart to be delivered? You will need to be equipped with a 1 7/8" or 2" tow ball. We are located in Jackson, Michigan (MI). Our zip code is 49201. We are presently working to make this option available. Yes, we have an online credit application that must be completed and submitted for approval. The item "Hot dog cart vending concession stand trailer new Grand Master model" is in sale since Saturday, March 28, 2015. This item is in the category "Business & Industrial\Restaurant & Food Service\Vending & Tabletop Concessions\Other Vending & Concessions". 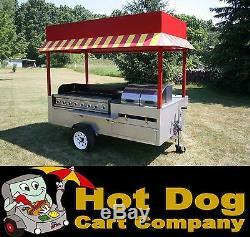 The seller is "hotdogcartco" and is located in Jackson, Michigan. This item can be shipped worldwide.